Brushing your teeth after eating is the single most important habit for healthy teeth. To keep both your teeth and gums in good condition, always brush your teeth twice a day with a soft-bristled, well maintained brush. Especially important is to brush your teeth before going to bed. This way your breath will be fresher in the morning, but also the pile of bacteria that can lead to gum disease and cavities, will not be allowed to rest in your mouth during the night. Brushing your teeth before going to bed is especially important. A properly used manual tooth brush cleans teeth very efficiently. However, in the real world most people are either not thorough enough or way too thorough, when brushing their teeth. They either remove the bacteria plaque only partially or gradually wear down their teeth. These two habits often motivate me to recommend using an electric toothbrush instead of a manual one. So here are the main reasons that the use of an electric toothbrush better protects your teeth. It is really as simple as that. Their ergonomic design and their whirring bristles are better in removing the bacterial plaque even in hard to reach areas, such as the back of the mouth and the gum line. Indeed, being too thorough can be equally harming to your teeth as being too sloppy. Too much pressure during tooth brushing or the use of hard toothbrush gradually wears down the teeth enamel and causes gum recession. While I can easily use a white filling to protect the eroded tooth, there is not much, I can do about the gum line. This issue is easily solved with the use of an electric toothbrush. Some models even reduce power automatically if you brush too hard! In any case, the ideal dental hygiene routine combines professional tooth cleaning every six months with regular tooth brushing in a gentle manner. Good ergonomic design ensures thorough cleaning even of the most hard to reach areas in the mouth. Good ergonomic design combining a large easy to grip handle with a round brush at the end of a long wedge, ensures thorough cleaning even of the most hard to reach areas in the mouth. Actually for most people, it is the other way around. They rarely brush their teeth long enough to remove all the bacteria. So the built-in timers of electric toothbrushes come in handy. In today’s digital world there is an app for almost everything. There are actually several tooth brushing apps for children and adults alike. 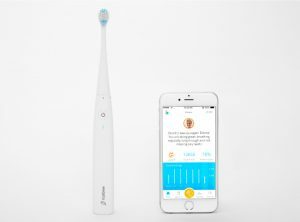 Some toothbrushes are connected with their own app. These apps transform tooth brushing, to a playful digital experience for young kids. 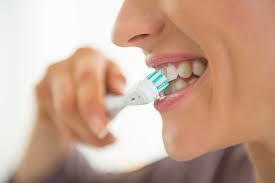 They also provide adults with data on their brushing habits and guide them towards proper use. Electric Toothbrushes are useful and clever gifts for young and old, men and women alike. They are affordably priced and there are always some good ones on offer. This Greek pharmacy, has currently a big variety of electric toothbrushes on offer as I am sure there are equally many in the UK. Kolibree markets a smart electric toothbrush, that comes with a great app for kids. 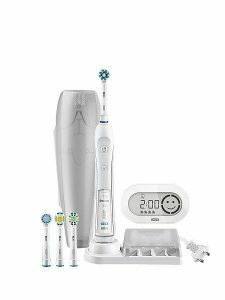 Electric toothbrushes make it easier for most people to maintain good dental hygiene. They are an affordable, useful gadget, that will help you and your loved ones flash a bright Smile for longer. So why not give it as a Christmas present?